There are few burial places in London, or even the whole of Britain, that are as famous and evocative as Highgate Cemetery. Established in the early years of Queen Victoria’s reign, the site is deservedly branded a ‘Victorian Valhalla’. Known for its elaborate Neo-Gothic tombs, foreboding mausoleums, and sculpted stone angels, the cemetery spreads across fifteen hectares on a hill to the north of the city. Among the 170,000 people whose bodies reside in the cemetery are many famous figures who made their names in politics, sport, and the arts. Neo-Gothic entrance to the western section of Highgate Cemetery. At the start of the nineteenth century London’s deceased were usually interred in the graveyards of local churches, a practice inherited from the early Middle Ages. With the city’s rapid urbanisation and booming population, however, these churchyards were soon overcrowded. A new solution was needed. Seeing a gap in the market private companies established their own cemeteries around the city’s suburban edges. One of these was the London Cemetery Company, which opened Highgate Cemetery in 1839. Named after the area, it was the third of what came to be known as the ‘Magnificent Seven’, a series of Victorian burial grounds encircling the inner city. Demand from middle class Londoners continued to grow, and in 1856 the cemetery was expanded eastward. 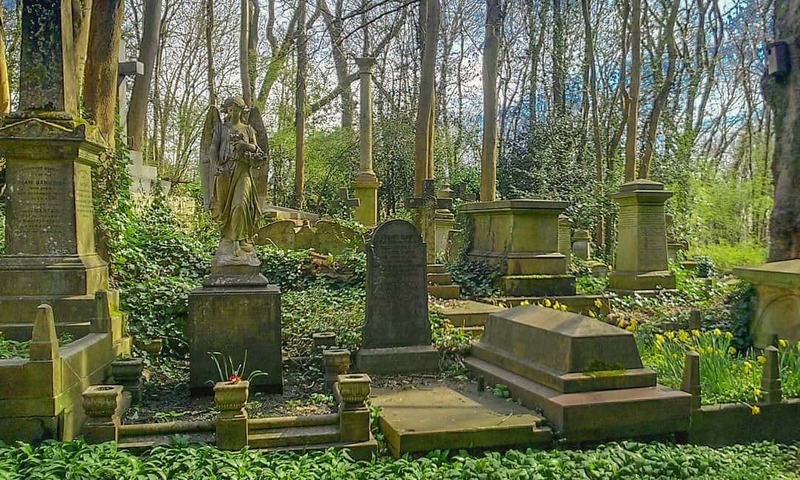 Highgate Cemetery is a quintessential piece of Victoriana and its fortunes declined with the shifting funerary fashions of the twentieth century. Lavish, expensive tombs were no longer popular and Neo-Gothic architecture became passé. By 1960 the London Cemetery Company was bankrupt. Over the years the cemetery became increasingly dilapidated as woodland engulfed its crumbling tombs. Tales of a ‘Highgate Vampire’ spread through London while vandals and thrill-seekers embraced the site as their nocturnal haunt. 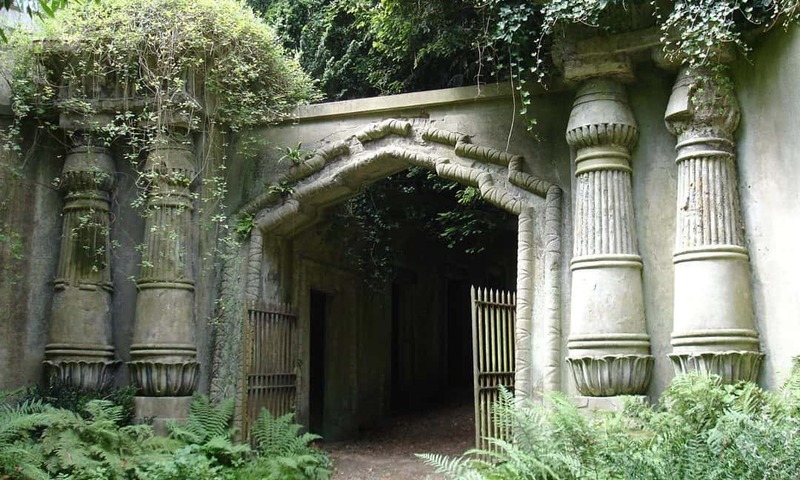 Before the decay became irreversible, a charity known as the Friends of Highgate Cemetery stepped in and took control in 1981, initiating a process of conservation that continues to this day. A public road known as Swain’s Lane divides Highgate Cemetery in two. Although the entrances to both the eastern and western halves are opposite each other along this road, the two sides have very different entry requirements. Visitors are only allowed into the western cemetery when part of a supervised tour group, which on weekends start every half-hour. On a recent trip to Highgate I decided to visit the western cemetery first, so on arrival I booked myself on the next available tour. 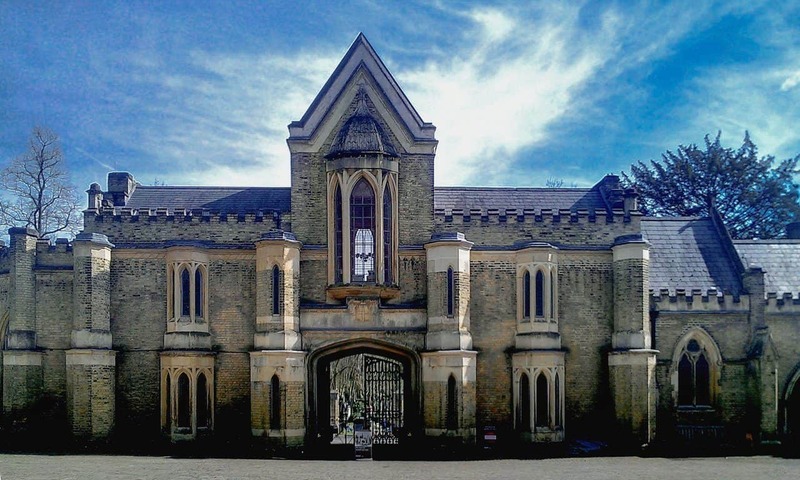 The ticket office is located within the cemetery’s charming original Neo-Gothic chapel, where a selection of books and postcards are available for purchase. The guided tour system has both its pros and its cons. On the one hand, it allows you to learn from the expertise of one of the cemetery’s volunteers (although I did notice a few inaccuracies in what our tour guide was telling us). On the other, it prevents the visitor from exploring the western cemetery at their own leisure. This means that there are various graves – including that of the recently interred singer George Michael – that the visitor never gets to see because they are not featured on the tour’s route. It also means that visitors are rushed around the cemetery in 70 minutes. I could easily have spent twice that length of time roaming through its winding footpaths. The western cemetery remains heavily wooded, contributing to the romantic, ruined image that the Friends charity seeks to preserve. I visited in the spring, which I feel is perhaps the best time of year to visit the cemetery, and the smell of wild garlic was strong in the air. Although lacking the sheer number of famous names of its eastern counterpart, the western cemetery is the more grandiose of the pair. It contains several impressive Victorian marvels that unashamedly flaunt the wealth of their patrons. Many of these are Neo-Gothic or Gothic Revivalist in design, displaying a love of spiralling turrets and faux-medieval features that one can also see on other mid nineteenth-century buildings in London, most notably the Palace of Westminster. Egyptian revivalist architecture at the entrance to the Egyptian Avenue in the western part of the cemetery. 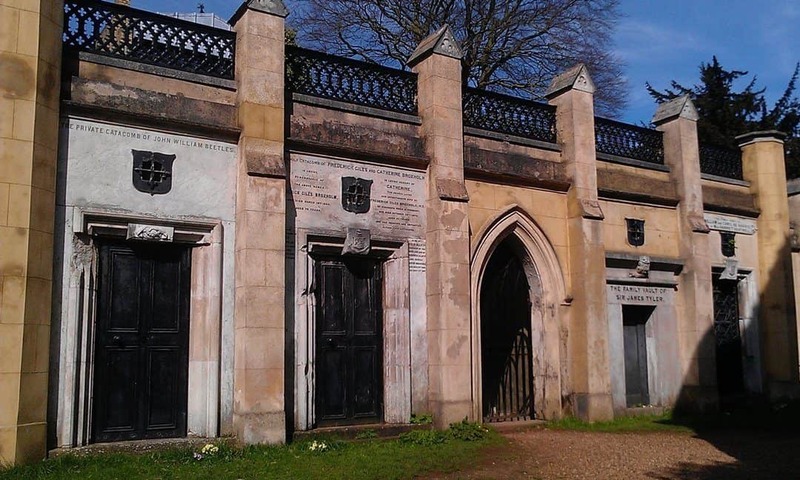 The Victorian obsession with Egyptomania is reflected in the Egyptian Avenue, a series of burial chambers decorated with faux-Egyptian patterns and obelisks. Our tour passed through the Avenue and on to the Cedar of Lebanon, a circular subterranean parade of mausoleums encircling a large cedar tree. It is a fascinating space that is quite unlike anything else that I have seen in England. Emerging from this area, the tour-guide took us into the Terrace Catacombs, a darkened passage with room for over 800 coffins. Not all of those buried in the western cemetery desired such an ostentatious memorial. More understated is the burial ground for Non-Conformist Christians, home to the resting place of Michael Faraday for example, the scientist who greatly advanced our understanding of electricity. Just a few metres away is a twenty-first century tomb built from concrete and glass, erected on land that the cemetery sold in the 1960s. More than one member of the tour group remarked on how out of place it looked. But it serves as a timely reminder that Highgate Cemetery is not a museum exhibit, rather an ever-changing space reflecting developments in London life. On completing a tour of the western cemetery, I crossed Swain’s Lane to the eastern side. The feel here is very different. Whereas the main attraction of the west is the majestic architecture of its grand old mausoleums, the eastern side is sold to the visitor on the many famous names that are buried here. At the entrance, I was given a pamphlet listing a hundred deceased notables with a map pointing out where I could find them. The cemetery gives top billing to Karl Marx, the German socialist and sociologist who co-founded Marxism. It contains both his original, simple, resting place from the 1880s as well as the larger, modernist monument erected by the Communist Party of Great Britain in the 1950s. The site has since become a place of pilgrimage for many socialists. When I visited, there were many flowers at the base of Marx’s monument, including a red-and-white flower arrangement in the shape of a hammer and sickle. Seeking to display their devotion to the socialist cause, a number of left-wing people have been buried around the area of Marx’s tomb. Among the most prominent are the Iranian activist Mansoor Hekmat, the British historian Eric Hobsbawm, and the Trinidadian journalist Claudia Jones, who co-founded the Notting Hill Carnival. 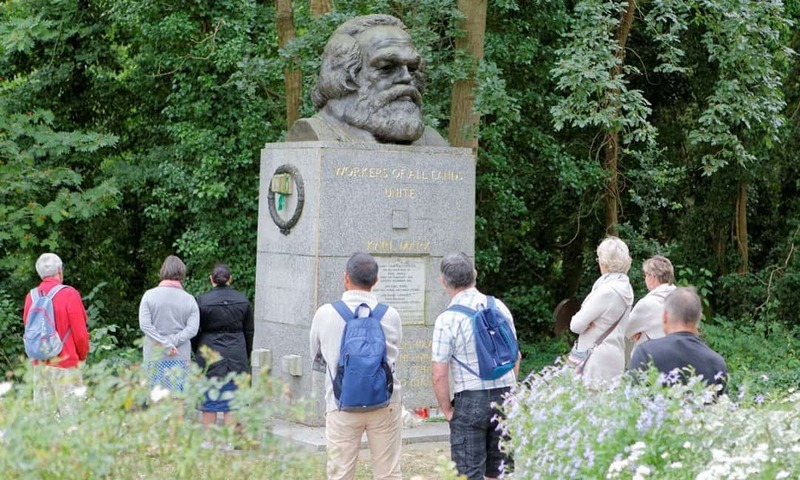 A keen interest in socialist history is certainly not a prerequisite for visiting Highgate Cemetery; there are many other famous names here from the arts and popular culture. These include the author Douglas Adams, the artist Patrick Caulfield, and the television presenter Jeremy Beadle. Readers of Archaeology Travel might be interested to learn that Peter Ucko, the prehistorian and Egyptologist who directed University College London’s Institute of Archaeology from 1996 to 2005, is also buried here. The back of his tombstone contains a motif inspired by Europe’s prehistoric Goddess figurines. Not restricted to following a tour guide, I found I could enjoy the eastern cemetery at my own pace. Parts of it have, like the western cemetery, been engulfed by trees, bracken, and ivy, but other areas are scrutinously maintained. There is also an interesting juxtaposition between Victorian graves and more recent additions, which are, sometimes very conspicuously, interspersed amongst many older graves. On one level, a meander through the eastern cemetery is like viewing a snapshot of modern British social history, replete with many of its heroes and villains. At the same time, it is an ideal place for peaceful contemplation. Map of Highgate Cemetery in north London. Zoom in/out with the +/- buttons, and drag the yellow pegman onto blue dots to see 360º highlights of various parts of the cemetery. Those with only a passing interest or who want to see a specific grave may be content to visit only the eastern cemetery (you can download a map off the official website), while those seeking a deeper appreciation of Highbury’s history would do better to see both halves. Fortunately, both can be catered for. A ticket for a tour of the western cemetery includes entry to the east. These joint tickets cost £12 per person, or £6 for those aged between 8 and 17. From Monday to Friday, only one tour of the western cemetery is scheduled per day (starting at 13h45) and it is recommended that the visitor books online well in advance (see the Tours section on the website). On weekends, tours take place every half hour between 11h00 and 16h00 (15h00 in the winter). These cannot be booked in advance and are provided on a first come, first served basis so it is best to get there early. There is also an option for those who wish to visit the eastern cemetery without taking a tour of the west. Entrance is £4 for adults and free for children or members of the Friends charity, with tickets available at the eastern entrance booth. Although Highgate Cemetery was established in what was a semi-rural suburb, today this part of North London is now more densely populated. This means that the cemetery cannot be appreciated within its original landscape, but an advantage is that it is served by a number of public transport links. The nearest station on the London Underground system is Archway, located on the Northern Line’s High Barnet branch. The route from the station to the cemetery is not well signposted, so it is advisable to check details of the route in advance. Fans of modernist architecture may wish to take in Peter Tabori’s design for Stoneleigh Terrace along Raydon Street, which is half-way between Archway and Swain’s Lane. The walk should take between ten and fifteen minutes depending on how fast you walk, although be warned that the journey up Swain’s Lane is a little steep. Entrance to crypts in the western section of the cemetery. Visitors to London are spoilt for choice when it comes to places of historical and archaeological interest. 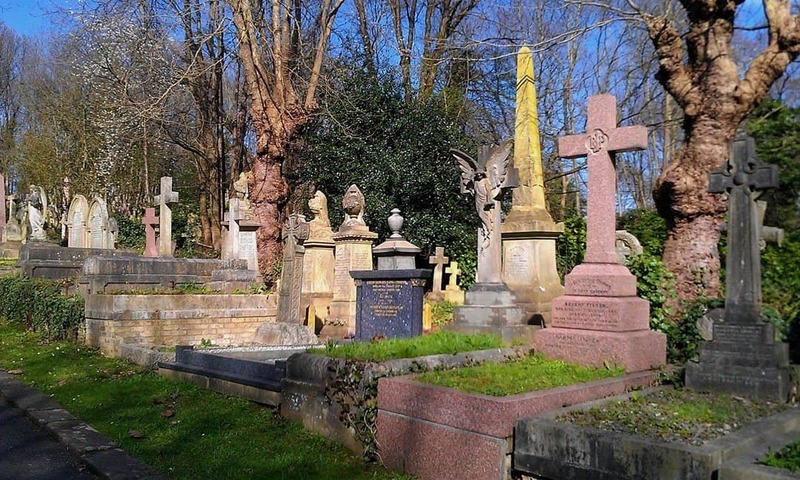 If you are looking for a break from the museums and art galleries, however, and would like to spend some time outdoors then you could do worse than spending half a day at Highgate Cemetery. Amid the hustle and bustle of the city, the cemetery is an oasis of calm and a pertinent reminder that Londoners continue to live alongside their history. It may be famous for its Victorian architecture, but it is still a living cemetery, where people today continue to bury their dead and pay their respect to deceased heroes.